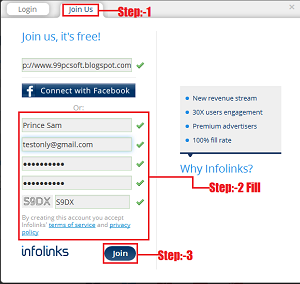 Infolinks is a best site which help bloggers for earning money.it is a best way for earning money online and it's process is so simple. 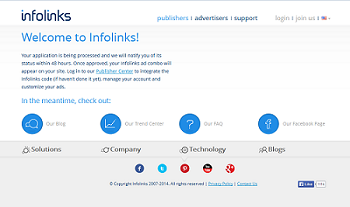 Infolinks allows you to generate money as a publishe.So don't waste your time Use Infolinks and generate a lot of cash quickly. Follow below steps and start earning ..!! Step:-7 Now Your application is being processed and Infolinks will notify you of its status within 48 hours. 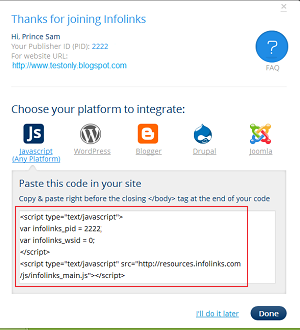 Once approved, your Infolinks ad combo will appear on your site. In Infolinks Dashboard You Can see your Today,Yuesterday,Monthly earning and CPC etc. Note:-Infolinks only pay $50 Infolinks will pay money via Paypal,Wiretransfer and Payoneer Card.